To add this infographic to your site, please copy the embed code from the box above and paste as desired. You may think an apartment move is simpler than a house move because of the minimal space and reduced cargo, but there are still many factors to consider and careful planning to be done to ensure moving day goes off without a hitch. The following guide will provide you with some tips to make your apartment move an easy one. Notify your landlord. 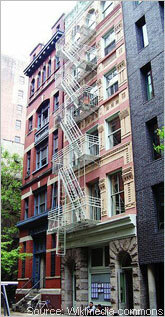 Once you decide to move into a new apartment, you are required to give your current landlord notice of your departure. The length of time required for notice varies depending on the complex, but usually ranges from 60 to 90 days. Review your old lease. Read through your lease to check up on the required condition you are expected to leave your apartment. Do you have to repaint the walls back to their original color? What are the conditions for you to be refunded your security deposit? Find out how and when you will get the deposit back from your landlord before moving out. Clean your old apartment thoroughly. To ensure return of your security deposit, restore your apartment to the pristinely clean state it was in when you arrived. Make sure you empty out the refrigerator, unplug it and let it defrost overnight. Make any necessary repairs and fix minor damages you may have made during your stay, such as spackling nail holes in the walls. Take out all trash and place it in the proper receptacles. Take plenty of pictures of the empty apartment to prove what state you left it in, in case the landlord does decide to dispute the return of your security deposit. Clean and inspect. Before even signing the lease, you should test every appliance in the apartment to make sure it works efficiently--this includes the oven, refrigerator, dishwasher and washer/dryer. Check the toilet, shower and faucets as well. Take photos of the apartment to prove its state when you move in, and if the landlord promises to make any repairs, have it included in your lease. Once you move in, you will want to meticulously clean and disinfect the apartment. Change the locks. Chances are you are not the first tenant to inhabit this apartment. To rest assured that there are not copies of the keys to your home floating around, ask the landlord's permission to install new locks. Measure doorways, stairways and hallways. Before even beginning the process of lugging your furniture to your new apartment, you will want to be sure everything will fit. Use a tape measure to calculate the width and height of all doorways, hallways, staircases and any other narrow space your furniture will have to pass through. 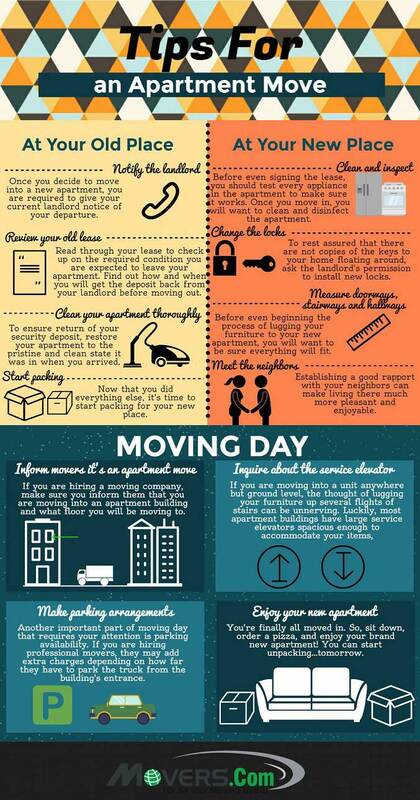 Use these guidelines to plan the route you will use to move your belongings into your new pad. Meet the neighbors. An apartment building is like a community. Establishing a good rapport with your neighbors can make living there much more pleasant and enjoyable. Introduce yourself to the other tenants on your floor and in the rest of the building. You may want to do this before you even sign a lease, so you can ask questions about the building concerning noise levels, maintenance, and other topics of concern. Inform movers that it is an apartment move. If you are hiring a moving company, make sure you inform them that you are moving into an apartment building and what floor you will be moving to. Some companies will charge more the higher up you are, the more stairs they'll have to climb, etc. When you are receiving an estimate, give them all the pertinent information about the location for a more accurate quote. Inquire about the service elevator. If you are moving into a unit anywhere but ground level, the thought of lugging your furniture up several narrow flights of stairs can be unnerving. Luckily, most apartment buildings have large service elevators spacious enough to accommodate your most cumbersome items. However, during the busier moving seasons, there may be several people that want to use the elevator at the same time. Call your new landlord to reserve the elevator several months before your scheduled move-in date. Make parking arrangements. Another important part of moving day that requires your attention is parking availability. If you are hiring professional movers, they may add extra charges depending on how far they have to park the truck from the building's entrance. Speak with the landlord to make arrangements for the most convenient place you are permitted to unload the truck, or devise a plan to arrive at the complex early, park your own car strategically in front of the building, and save the spot for the moving truck. How Do You Move Long Distance?